The sequence played out in what’s encapsulated Kobe Bryant’s career. The clock ticked down as his team trailed by one. The ball remained in his hands. And, of course, Bryant buried the game-winning jumper. This game didn’t take place at Staples Center and Bryant wasn’t even wearing a Lakers uniform. Instead, this play that he’s performed countless of other times happened at Colonel Leon H. Washington Park where Bryant played in a Drew League pick-up game during the 2011 NBA lockout. With the Drew League celebrating its 40th anniversary this summer, officials still have vivid memories of Bryant’s appearance and ultimate game winner. In part to rekindle his love for the game and to test out his right hamstring, Steve Nash dressed up and competed in a sport that didn’t involve a basketball and pick-and-rolls. Instead, Nash traded his sneakers for cleats and tried out Tuesday for the Inter Milan soccer team. Make no mistake. Nash never intended to try to make the team. He kind of has two years left on his contract with the Lakers. And for all the limitations surrounding Nash’s injury plagued season, the Lakers would surely miss his presence. Among all the long-term struggles the Lakers could face with Dwight Howard’s departure to the Houston Rockets, there could be one unintended benefit. Pau Gasol will remain a Laker, surviving yet another season filled with trade rumors. He might also find his groove back. “Now with Dwight gone I am the reference inside and I am more like I was a couple of years back when we made the Finals three straight times and won two straight championships,” Gasol told The Associated Press on Tuesday. Gasol remained supportive of Howard, described as a “nice guy” and a “hard worker.” He also sounded hardly surprised about Howard’s departure, saying it was “always a possibility.” But Gasol seems relieved Howard’s departure enabled him to stay with the Lakers. Nothing regarding Mike D’Antoni’s first season with the Lakers went according to plan. He envisioned the Lakers restoring Showtime. Instead, they struggled throwing the ball in the ocean. He wanted the Lakers to play at a fast pace. Instead, they appeared too old and hurt. He believed his reunion with Steve Nash would lead to instant offense. Instead, Nash’s injury competing with philosophical differences among Dwight Howard, Pau Gasol and D’Antoni led to little clarity on offense. Oh yeah, and then there’s the offseason where Howard jetted to Houston and the Lakers lost Metta World Peace and Earl Clark for financial reasons stemmed from more punitive tax measures in the NBA’s recent labor deal. What did D’Antoni make of Howard’s decision to leave? Plenty share Howard’s pessimism on if the Lakers would be the best chance to help him win an NBA championship. Some are even skeptical if the Lakers could even make the playoffs, something that has happened only four times in franchise history. For a brief moment, Magic Johnson didn’t appear in the mood to laugh or smile. That’s because the famed Laker couldn’t help but acknowledge the unsettling reality surrounding the purple and gold, including their championship aspirations and the rehab surrounding Kobe Bryant’s torn left Achilles tendon. Here’s how most NBA players spend their summers. They hang out by the beach. They hit up night clubs. They’ll sneak in some basketball in pick-up games and private workouts. Here’s how Pau Gasol spends his summer. He spends one of those weeks traveling to Iraq as a UNICEF ambassador. Details of his trip weren’t immediately available. 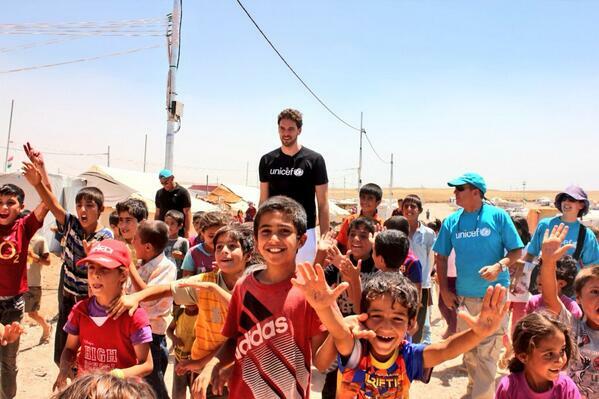 UNICEF officials and people close to Gasol kept the location secret for obvious reasons. Ever since the U.S-led invasion of Iraq in 2003, concerns over security and political factions remain. But if history serves as any indication, it’s likely Gasol helped with various humanitarian efforts. He also traveled to South Africa (2005), Angola (2007), Ethiopia (2010) and Chad (2012). Each trip involved a specific responsibility, including feeding efforts (Chad, Ethiopia) and handing out medicine to help eradicate the HIV virus (South Africa, Angola). Gasol’s interest in UNICEF stems from his medical school background at the University of Barcelone and his passion for helping people in need. His involvement with UNICEF as well as with Los Angeles Children’s Hospital earned him the NBA’s J. Walter Kennedy Citizenship award in 2012. Will Kobe Bryant end career with more rings than Derek Fisher? Time Warner Cable SportsNet’s Andy Adler, Dave Miller, ESPN 710’s Beto Duran and I talked all the things Lakers the other day. That included weighing what impact Jordan Farmar’s return to the Lakers will have. That included hitting on many themes. Farmar joined the Lakers on a one-year, veteran’s minimum deal with the Lakers despite earning a lucrative contract last season playing overseas in Turkey. We compared and contrasted Farmar’s frustration with Phil Jackson’s triangle offense and his confidence he’ll fit in well with Mike D’Antoni’s system. And we explained the value in Farmar bringing depth to the team’s point guard unit. In a move that finalizes Mike D’Antoni’s coaching staff, the Lakers officially announced that Kurt Rambis and Johnny Davis will becomes his assistants. The Lakers were strongly expected to make these hirings in recent weeks. But the announcement didn’t happen until Monday morning. Rambis first shared the news on his Twitter account. The two have stayed linked through championship glory and respect. Kobe Bryant and Derek Fisher entered the NBA in 1996 with the Lakers as rookies and ended their partnership combining for five NBA championship rings. Though the talent disparity between Bryant and Fisher remained wide, the two developed respect for each other for their serious approach to their craft. And Bryant’s demanding leadership style complemented Fisher’s more inspiring touch. Will Bryant end his career with more rings than Fisher? That was the topic Time Warner Cable SportsNet’s Andy Adler and Dave Miller, 710 ESPN’s Beto Duran and myself tackled on a recent segment. It’s a timely topic for a number of reasons. Fisher announced he will retire after signing a one-year deal to play for the Oklahoma City Thunder this season. Bryant’s in the final year of his contract with the Lakers worth $30.5 million, though he has stated he plans to go beyond that. The Lakers reached an agreement with undrafted rookie free agent Elias Harris to a two-year deal, according to a league source. Harris’ contract involves a partial guarantee at the veteran’s minimum his first season, while the Lakers hold a team option on the second season. Yahoo! Sports first reported the signing. Harris averaged 10.2 points and 5.6 rebounds in five games with the Lakers in Las Vegas Summer League. The 6-8. 240-pound forward averaged 14.6 points and 7.4 rebounds last season at Gonzaga. The Lakers currently have 12 players signed under contract for next season. Second-round draft pick Ryan Kelly is likely to stay with the team, bringing that number to 13. NBA teams are allowed to field a maximum of 15 players on their roster.